Comments: A Campbell's single decker parked in Station Lane adjacent to Railway approach. Comments: Primrose Villa. Built in the early 1900s and home to the Campbell family for many years. Empty at the time of this photograph. For many years J.W. Campbell & Sons Ltd, operating as Campbell's Motor Services ran a number of bus routes in pre-new town Basildon. These included services to the Shell Oil Refinery works at Coryton, Wickford, Hadleigh and local schools services. The family concern were eventually bought out by the Eastern National Omnibus Co. in February 1956. They operated from an address at Station Parade, Pitsea and had their works depot in Station Lane, virtually opposite Railway Approach. Their small fleet of vehicles was mainly made up of single dekkers but did include two double dekker buses. These were all transferred to Eastern National at the time of acquisition though few lasted long in service after the transfer before being withdrawn and eventually scrapped. The business was founded in 1890 by Herbert or Charles Campbell who opened a coal yard at Pitsea Station wharf. By 1895 John William Campbell had taken over and the business soon expanded to include removals and haulage with the company later using the back of their own bus tickets to advertise these services. The family were originally from Ireland but settled in Pitsea and John, who in 1898 was living on the station estate at Chestnut Road, was also operating as a carman and would later drive the companys earliest passenger vehicles. It would be his sons Richard, Jack and Albert that would keep the family name going when he died in 1932. For more detailed information on Campbell's Motor Services there is an Essex Bus Enthusiasts Group publication entitled 'J.W. Campbell & Sons, Ltd. of Pitsea, Essex'. Published in 2002 and compiled by Alan Osborne, this 28 page book features 9 black and white photographs, history of the company, fleet list and many more interesting facts. 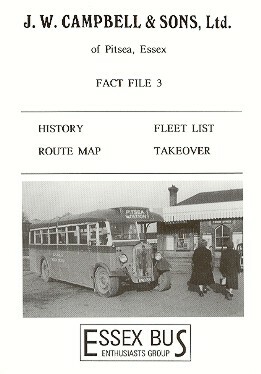 Details on how to obtain a copy of this publication and other Essex bus operators literature can be found at the Essex Bus Enthusiasts Group website. Ticket denominations for services came in a variety of different colours and started at 1d, with 1½d, 2d, 2½d, 3d, 3½d, 4d, 4½d, 5d, 5½d, 6d, 7d, 8d, 9d, 10d and 1/- examples all known to exist. Examples of all of these can be seen in the gallery. To the right is an example of a 'Bell Punch' Exchange bus ticket as used by Campbell's Motor Services. Campbell's also offered a coach and excursion service and this continued after 1956, finally coming to an end in 1971. Although the bus operator has long gone, the detached family home called Primrose Villa in Station Lane (now Pitsea Hall Lane), built in the early 20th century, still survives along with the covered depot in Terminus Drive. The depot building was later taken over in the 1960s by A.W. Pryor (Petroleum) Co. Ltd. as a storage facility for the distribution of texaco petroleum products. Both properties have recently undergone renovation work and are one of the few remaining pre-new town buildings left in the area. J. W. Campbell & Sons, Ltd.
F. H. Naish, Printer, South Benfleet. The timetable was produced by F.H. Naish whose printing business began around the early 1930s; being based in London Road, South Benfleet. It moved, possibly in 1951, to 202-204 High Road, South Benfleet where the building, just as it was at London Road, was known as the Victory Printing Works. It operated under a number of names including A. F. Naish & Son, and F. & M. Naish & Co. and was active until being wound up in 1988. Both addresses had a South Benfleet exchange number, this being 3115. Text researched and written by William Cox, 2004 with revisions 2007,2017. Copyright © 2004-2007,2017, B. Cox - Basildon History Online. All rights reserved.